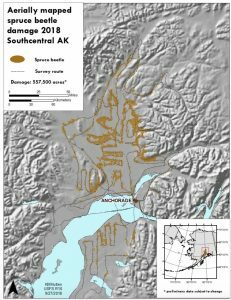 Two popular campgrounds north of Anchorage are closing, as the state works to mitigate dangers from spruce bark beetles. Earlier this week, the parks department announced the closure of Byers Lake Campground in Denali State Park, and South Rolly Campground in the Nancy Lake State Recreation Area. Stuart Leidner, Superintendent of the State Parks Mat-Su/Copper Basin Area, says beetle-infested trees pose a safety risk to campers, as rotten trees have been observed falling in the campgrounds. “It’s a static situation. And their tents, or their campers…from a safety perspective, the issue of a tree coming down greatly concerns us from just not wanting to see the public visiting our state parks injured,” Leidner said. Leidner says they’re starting with the two largest campground areas affected, but the beetle problem extends beyond them. He says smaller campgrounds will be addressed after work is done at the larger sites. 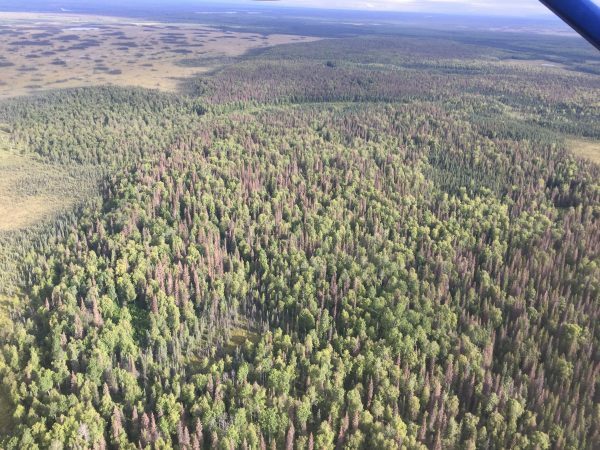 According to the latest data from the state Division of Forestry, around 500,000 acres of forest in the Matanuska-Susitna Borough were impacted by the spruce beetle outbreak in 2018. Leidner says the state is still waiting to secure funds for tree removal. But once the work gets started, they aim to reopen the campgrounds as soon as possible. The department says they’ll likely remain closed for the rest of the summer, and possibly into next year. In the meantime, Leidner wants to remind residents to be cautious and aware of the risks of starting forest fires if they choose to camp outside of a campground.